Here at BookNet we like to start 'em young. Start 'em reading that is. We don't often look so deeply into BISAC subjects below the top levels, but for this blog series we're calling out the sub-genres that have seen notable growth in recent years. These are granular subject categories that may go unnoticed or whose sales trends might be masked when lumped together among their higher-level, overarching BISACs, like the first in our series: Self-Help / Personal Growth. For our second post, we're taking a close look at the second-level Readers categories within both Juvenile Fiction and Juvenile Non-Fiction. These categories include titles for new readers (i.e., early readers) that are enjoyable and easy to read, with simple, appropriate language for the reading level. Within each Readers category, there are three sub-genres: Readers / Chapter Books, Readers / Beginner, and Readers / Intermediate. The overall Readers subject category in Juvenile Fiction saw a unit sales increase of 42% between 2013 and 2017, with a 6% increase between 2016 and 2017. Sales in the Juvenile Non-Fiction / Readers category increased by 29% between 2013 and 2017, including an increase of 9% between 2016 and 2017. Overall Juvenile Fiction sales have been plotted as a dashed line on a secondary axis in the graphs below to outline any potential changes in the category as a whole. The Juvenile Fiction / Readers category continues to see growth alongside the overall Juvenile Fiction category. 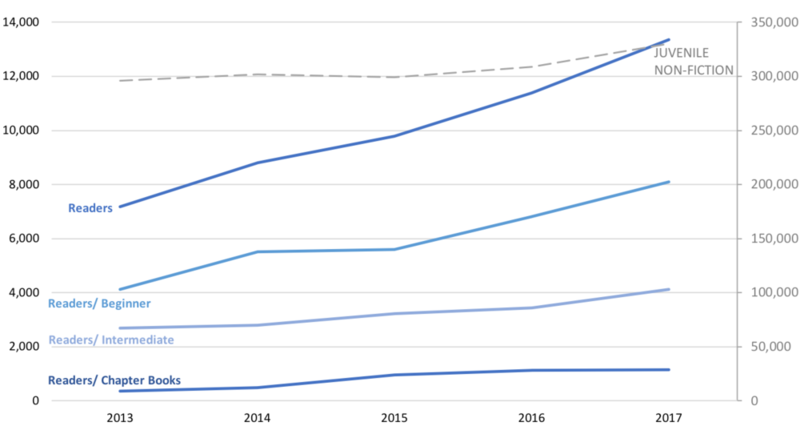 Looking at the three sub-genres, we're seeing the most significant growth in the Chapter Books category, although growth did slow down between 2016 and 2017 compared with the growth between 2013 and 2016. Since 2013, sales in the Beginner sub-genre have alternated between a slight increase and a slight decrease. Readers / Intermediate has experienced a slight decrease since 2013. Is the sales growth due to an increase of ISBNs in this category? For most of the third-level BISACs in the Juvenile Fiction / Reader category, the count of ISBNs published tends to match the sales trends. Though ISBNs with an Intermediate sub-heading continue their slow and steady decline from 2013 onwards. Two of these Juvenile Fiction / Reader top-selling titles are from 2017, while the top three are backlist from 2003, 2006, and 2014. Turning our attention to the Juvenile Non-Fiction category, the graph below shows that the main Readers category continues to see growth even as sales for the Juvenile Non-Fictioncategory are trending downwards. Overall Juvenile Non-Fiction sales have been plotted as a dashed line on a secondary axis in the graphs below to outline any potential changes in the category as a whole. The Chapter Books sub-genre, while experiencing an overall increase since 2013, shows a decline in sales between 2015 and 2017. Sales for Beginner and Intermediate books have both increased since 2016, after experiencing opposite sales trends between 2013 and 2015. The ISBN count for the Juvenile / Non-Fiction category does not seem to match the increasing number of ISBNs in the Juvenile Non-Fiction / Readers sub-genres, which are on a steeper incline from 2016 to 2017. When it comes to Non-Fiction, animal books for early readers and National Geographic Kids certainly steal the show. Only one of the top-selling titles is from 2017; the other four are backlist from between 2012 and 2014.
Who are the top-selling authors in both the Juvenile Fiction / Readers and Juvenile Non-Fiction / Readers categories? Each contributor is listed along with their top-selling title. Seven of the top-selling authors for 2017 all happen to have Juvenile Fiction / Readers / Chapter Books as their top-selling titles. Two of the corresponding top-selling titles are Juvenile Fiction / Readers / Beginner, while one title is Juvenile Non-Fiction / Readers / Intermediate. 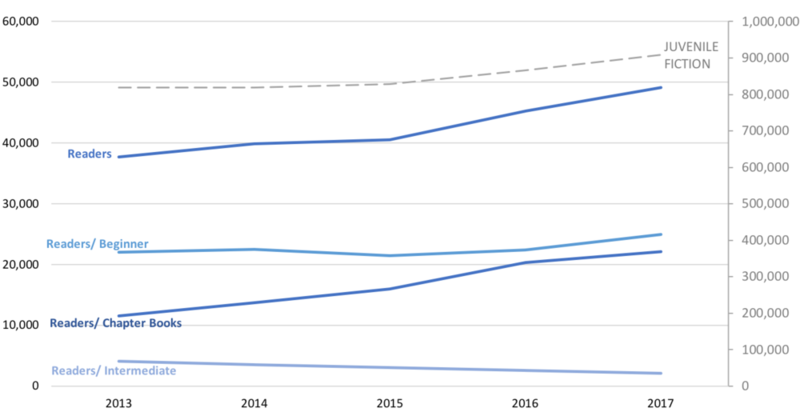 Looking at 2017 sales broken out by publication date, we find that most of the titles sold in 2017 were published in 2017, but there's a strong showing of titles from 2013 to 2017, indicating that the category has a relatively strong backlist. 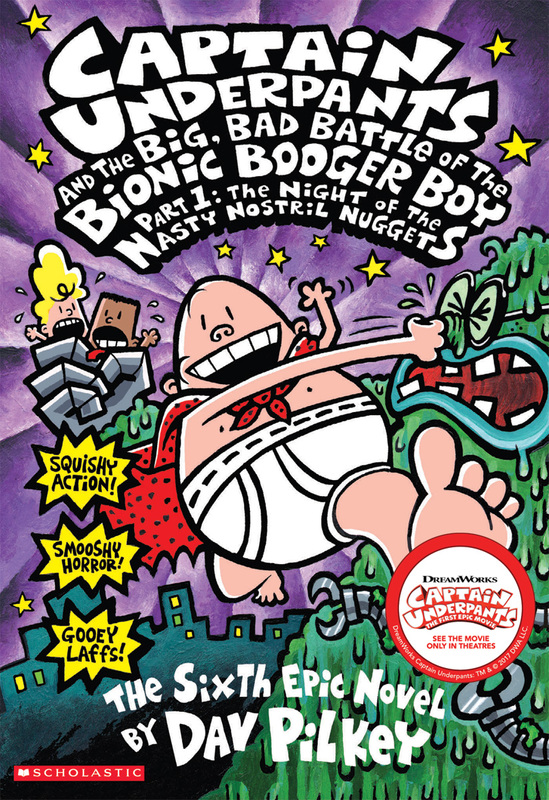 Looking at the top five Juvenile Fiction / Readers titles so far in 2018, three titles remain from 2017's top five: Captain Underpants and the Preposterous Plight of the Purple Potty People (Dav Pilkey), Rise of the Earth Dragon (Tracey West and Graham Howells), and Captain Underpants and the Big, Bad Battle of the Bionic Booger Boy Part 1 (Dav Pilkey). Tracey West's Chill of the Ice Dragon, published in 2018, has risen to the top spot, with Waking the Rainbow Dragon, also published in 2018, in the fifth spot. While the top five Juvenile Fiction / Readers titles so far in 2018 are full of underpants and dragons, the top five Juvenile Non-Fiction / Readers titles so far in 2018 emphasize animals. Farm Animals (Joanne Mattern and National Geographic Kids Staff) is in the top spot along with two other titles from 2017's list: Dog Finds Lost Dolphins! (Elizabeth Carney and National Geographic Kids Staff) and Animal Superstars (Aline Alexander Newman and National Geographic Kids Staff). New to the 2018 list is Cats, Level 1 by Joan Galat and Pete the Cat and the Cool Caterpillar by James Dean. Be sure to get a copy of The Canadian Book Market 2018 later this winter for a list of 2018's 10 bestselling Juvenile Fiction and Juvenile Non-Fiction titles, along with lots of other 2018 tidbits. Older PostThink you can code like our ebookcraft speakers?